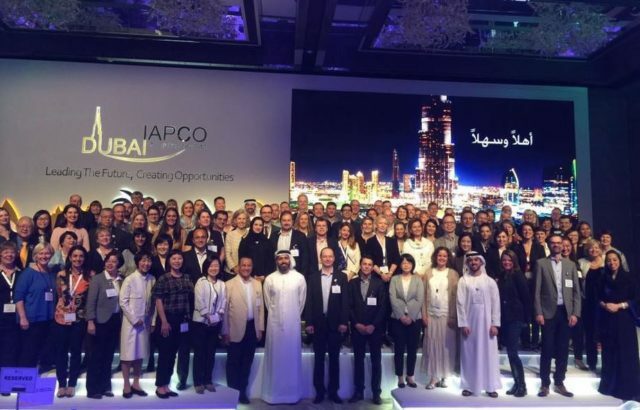 From 16th to 19th February, IAPCO hosted their annual meeting in Dubai with goal to evaluate 2016 results and discuss plans for 2017 for professional congress organizers and meeting planners. IAPCO, international organization for Professional Congress Organisers (PCO), ensures their members quality standing as one of the highest in the world in the Meetings Industry and among this year record number of 120 participants was also CD Congress Centre Ljubljana as the only Slovenian PCO. Programme of this year IAPCO meeting introduced 4 new members approved by the General Meeting (53 are still in the assessment process) and lectures focused on Storytelling concept, presentations of out of the box projects like EXPO 2020 Mission to Mars, clients understanding, etc. They presented also the statistics for IAPCO members in 2016 with 6.38 billion revenue generated and 9,860 meetings carried out. That all represents a 14 % increase over 2015, increasing the lease of hotel rooms by 4.5 %, a little bit of downturn in the average number of nights per meeting and a fact that accompanying congress exhibition occupied an area of ​​nearly 1 million m² (exactly 978,962 m²). The CD Congress Centre Ljubljana team as one of the IAPCO members and the Slovenian leading congress centre acknowledges the importance of IAPCO membership that without a doubt brings many advantages, new connections, knowledge, sharing a pool of experience in terms of worldwide destinations, professional competency and technical know-how, etc.